Deciding to build a new home or undergo a renovation is a major decision. One of the most crucial aspects of such a project is choosing a residential architect who understands your vision and can bring it to life. Residential architects possess not only the creativity to design your dream home, but also the experience and know-how to coordinate with contractors, push plans through the permitting process, and more. As with any big decision, do your due diligence. First, learn the difference between a residential architect, an architectural designer and a design/build firm. According to Curbed, an architect is licensed by the state to design homes and oversee their construction or renovation. Architectural designers are not usually licensed. Design/build firms offer both design and build services in-house and may not work with licensed architects. With that in mind, ensure that you are researching licensed residential architects to work with for your home improvement or new construction project. To start, use the American Institute of Architects’ “Find an Architect” tool to search for architects in your area. Once you have a few names in mind, turn to family, friends, coworkers, social media and Houzz to assess their reputations. Once that you have narrowed down your list of potential hires, it’s time to learn what to expect from a residential architect. Meeting with a residential architect–or a few potential hires–ensures that the partnership yields a good fit. This is the time to share your thoughts and ideas about your dream home. Plus, the consultation allows you to ask the important questions that determine the project’s framework. Ask the architect for references and what you can expect in terms of fee structure and costs. References not only speak to a firm’s reputation but shed light on an architect’s experience with cost estimates and completing projects within budget. Additionally, you will want to make sure the architecture firm is insured. Be open about your budget and your plans. Discuss with the residential architect any challenges or important considerations the project may entail. You can also ask the architect about mutual expectations throughout the project. Find out the time commitment and how hands-on you may or may not need to be. Make sure it is clear what elements of the process the architect will handle–choosing a contractor, for example, and filing permits–and what you are expected to do. Finally, once you have settled on the right architecture firm for your project, ask to meet the rest of the team. Establishing rapport is essential to open communication with the experts that will make your dream home a reality. 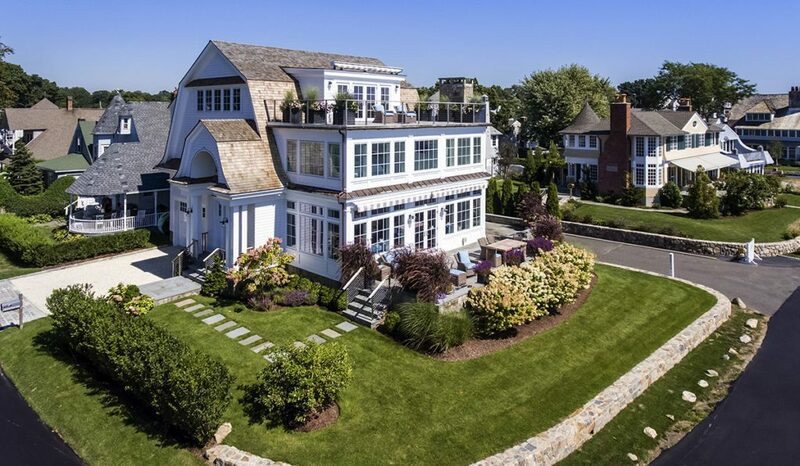 This is true whether you are building a brand-new home or undergoing a renovation, such as this Rowayton project, above, that added a third floor and deck overlooking Long Island Sound. During the design phase, the residential architect will analyze the project site and assess its current conditions. Next come the conceptual drawings or ideas that marry the client’s wishes with the architect’s aesthetic and schematic sensibilities. It is best for homeowners to think broadly at the start of the project and not get bogged down by details such as fixtures, furnishings and colors, which will come later. This portion of the process can take time. 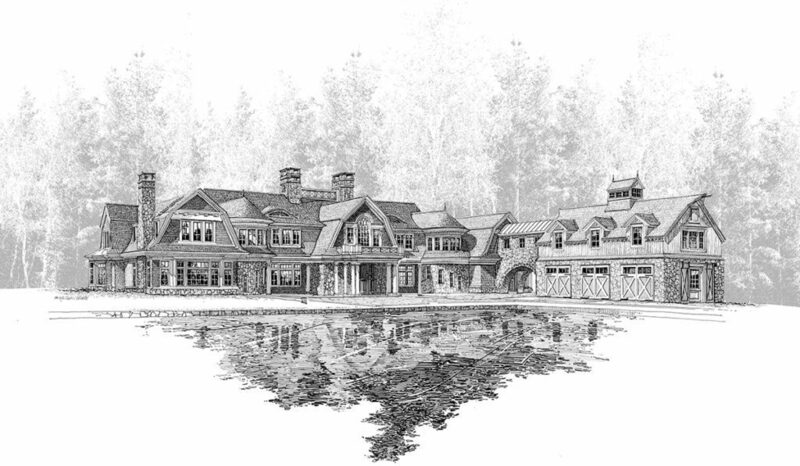 Residential architects may produce several concept designs for clients to review and see which best meet their goals. This could lead to as much back-and-forth and discussion as needed for the ideal new home or renovation to manifest itself. For firms like Cardello Architects, the design phase emulates architecture as an art form, with sketches and renderings treated as handcrafted works of art that represent the client’s vision. 3-D models offer a useful tool for clients, which helps them visualize their new home or renovation. After the client and residential architect agree upon the project’s general direction, the sketches and renderings become more intensive. This means that the project entered the documentation phase. This phase includes detailed drawings illustrating assemblies and lists of materials needed for review in the permitting process. Residential architects assist clients by helping obtain the permits needed for the start of construction. Project drawings must be submitted to your local P&Z, reviewed according to local safety codes, and approved. This can take weeks or months, depending on the municipality. Most importantly, involve the residential architect in this portion of the project. Residential architects not only help you navigate process, but also answer potential questions from the local planning and zoning boards. Ultimately, this helps reduce the risk of unexpected delays. Coordinating construction either falls under the client’s purview or the architect’s. However, a good residential architect provides recommendations for a reputable contractor. Therefore, if you do not already have an contractor in mind, a residential architect helps. The architect offers a few names and guides you through the bidding process. Ultimately choosing the right person for the job. In order to keep the project moving forward, selecting a contractor can happen as early as the design phase. But, typically this step occurs prior to filing the permits, Curbed notes. Although the contractor oversees construction, the residential architect’s role does not end there. The architect operates behind the scenes, responding to the contractor’s questions or troubleshooting issues as they arise. But coordinate regular site visits with the architect, contractor and subcontractors. This ensures that the outcome of your project results in your vision. This is also a good time to work with the architect and the team to make any final decisions on fixtures, appliances, furnishings and other details. 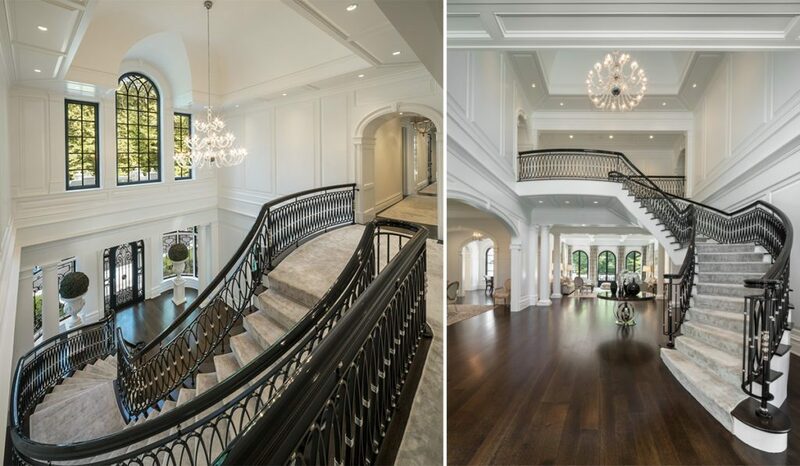 The above Georgian Style custom home in Greenwich showcases how well developed and deliberated design can be, from the spectacular floating staircase to the custom-wrought iron detail and expansive ceiling height. A good residential architect should see your custom home or renovation project through from start to finish. From the initial consultation through the design and documentation, permitting process and construction, you want a team that understands your vision and carries it through every step of the way. Cardello Architects is a full-service architecture firm that combines extensive experience, a strong creative spirit and comprehensive knowledge with an efficient process to provide all of our clients with the perfect architectural design to meet your needs and suit your tastes. Services range from consultation and design development to bidding and construction administration.